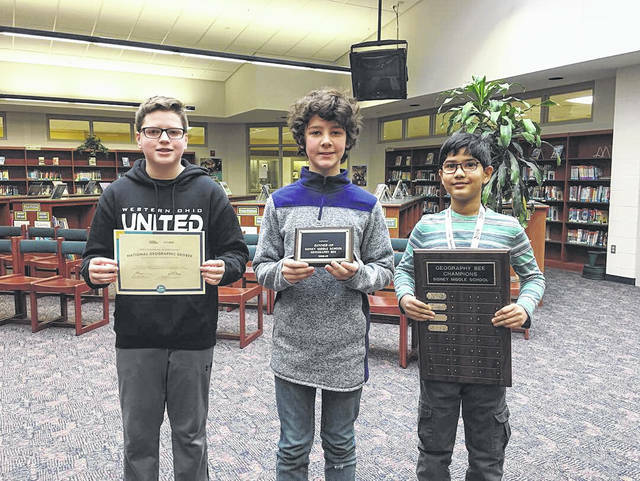 Brady Hagan, left to right, Alex Frew, Pratisth Agarwal were the top three winners in the Sidney Middle School Georgraphy Bee. Pratisth finished first; Alex was first runner-up; and Brady finished in third place. 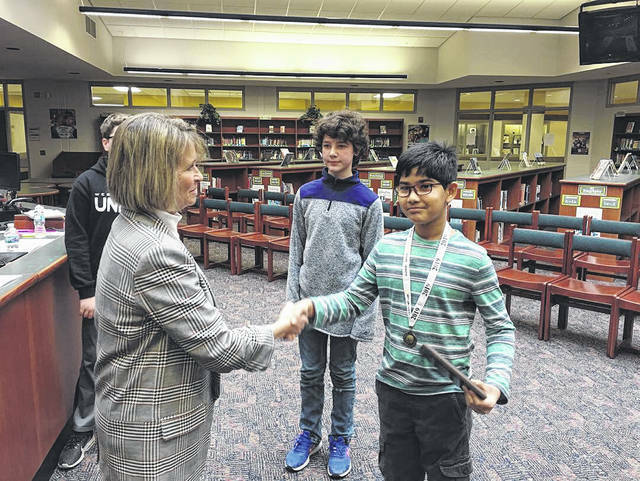 SMS Social Studies teacher Kathy DeVelvis congratulates Pratisth Agarwal, winner of the SMS National Geographic Bee, as first runner-up Alex Frew, center, looks on. SIDNEY — Sidney Middle School fifth-grade student Pratisth Agarwal won the school-level competition of the National Geographic Bee held in January. Agarwal is now one step closer to winning a $25,000 college scholarship, the grand prize at the national competition to be held in Washington D.C. May 19-22, 2019. The middle school-level bee challenges students in oral questions on geography, narrowing the field to ten students in the second round and a final two in the final round. This was the first round in the 20th annual National Geographic Bee, sponsored by the National Geographic Society. School winners from thousands of schools around the United States and in five U.S. territories participated locally in the first-round competition at their schools. The school winners, including Pratisth, will now take a written test; up to 100 of the top scorers from each state will be eligible to compete in their state bee on March 29, 2019. The National Geographic Society will provide an all-expense-paid trip to Washington, D.C., for state champions and teacher-escorts to participate in the National Geographic Bee national championship. The first-place national winner will receive a $25,000 college scholarship and a lifetime membership in the Society. Pratisth Agarwal is the son of Krishna and Neha Agarwal, of Sidney. The runner up in the competition was seventh-grader Alex Frew, son of Chris and Nicole Frew. Seventh-grader Brady Hagan, son of Randy and Suzanne Hagan, finished in third place.